ALL CHARTER SCHOOL DIPLOMA PRINTING & DIPLOMA COVERS ARE HAND FOILED AND PRINTED IN THE UNITED STATES. 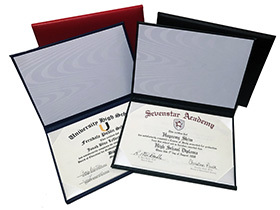 At Graduation Ink, charter school diploma printing and diploma covers are available in two styles - the Series 300, Series 500, and 850 diplomas. All of these charter school diplomas and diploma covers are light on school budgets and save time for administrators and office staff. Because of our unique process, charter schools can order in larger quantities to lower the overall diploma cost. The charter school diploma sheets are pre-printed with the school logo or mascot and the school name - the graduate's name is not included. Instead, we provide a downloadable template that is formatted to allow an office assistant the ability to feed the sheets into the printer and enter the student name to complete the diploma personalization. Charter school diploma printing orders can include the diploma cover, pre-printed diploma sheets, and a Microsoft Word template. The Graduation Ink Series 300 diploma sheet is printed in on a contemporary, speckled paper. 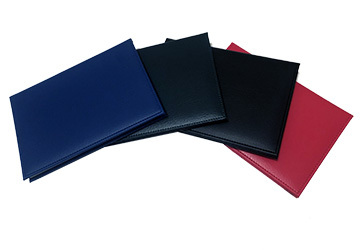 The diploma cover is made of an attractive red, black, blue, green, or maroon leatherette material. The cover is imprinted with a lamp symbol or your school name in gold or silver. 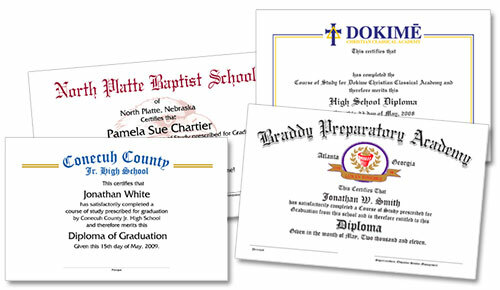 All Series 300 Charter School diploma printing and diploma cover orders include a gold or silver pawl (elastic cord). Extra diploma sheets will be provided to allow for spoilage. Closed Size: 5 1/2" x 8 1/2"
Colors may not appear exact on different computer monitors. *$35.00 setup charge for less than 20 diploma covers. *$25.00 design charge for less than 50 sheets, unless combined with covers. We offer a top of the line fully padded charter school diploma. The Series 500 diploma is printed on an ivory cover-stock paper. This charter school diploma cover is crafted with a padded, turned edge leatherette material in red, black, royal blue, and green. The cover is hand-imprinted with the charter school name in gold or silver foil. 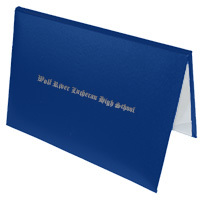 Diploma sheets are held inside of four silk corners. Acid-free sheet protectors are included. Closed Size: 5 3/4" x 8 3/4"
*$35.00 setup charge for less than 10 diploma covers. GRADUATION INK "CHARTER SCHOOL DIPLOMA PRINTING & DIPLOMA COVERS"